Row-to-row variance with bulk metering systems wasn’t really on the radar until recently, because farmers couldn’t really do much about it. Recent research by the Prairie Agricultural Machinery Institute (PAMI) at Portage la Prairie, Man. identified how much variation actually exists. “The general trend toward larger seeding equipment – in the 60-foot range and commonly even larger than that – created the need for information about how airflow rates affect both the delivery of seed and the potential for seed coat damage,” said Lorne Grieger, project manager with PAMI Agricultural Research and Development. The PAMI study was carried out in 2017 and looked at two used 60-foot air drills as representative of the many drills on the market. Wheat, canola and soybeans were tested with fertilizer. Soybeans were also tested at three moisture levels of eight, 10 and 12 per cent. Three fans speeds, low, medium and high fan speeds were analyzed. The stationary air drills were operated for the equivalent of one seeded acre at five miles per hour. A container under each opener collected the seed and fertilizer. Each test was repeated three times, and an independent laboratory analyzed seed damage and germination. Manitoba Wheat and Barley Growers Association, Manitoba Canola Growers Association and Manitoba Pulse and Soybean Growers provided funding. Grieger found that variation was the highest for canola. Soybean and wheat were similar with one air drill, while soybean had higher variation than wheat with the other air drill. Manifolds on the outer extremes of the toolbar tended to receive less product. There was also variation between the front of the toolbar and rear, with the rear typically receiving less product in wheat and canola. Fan speed did not appear to have an effect on overall distribution. Fan speed did have a slight effect on soybean germination with higher fan speeds generally causing a reduction, although minor. With average germination ranging from 93.4 per cent at eight per cent moisture, through 95 per cent at medium speed and 97 per cent at high speed, the slight reduction may not be agronomically important. Fan speed had no effect on germination in wheat or canola. PAMI testing found air drill product variance from 11 to 20 per cent. At SeedMaster, marketing and communication manager Cory Beaujot says that the company did their own variance testing several years ago on different industry manifolds. They found that row-to-row variance was between 20 to 23 per cent, meaning product distribution could be 10 per cent above or below the targeted rate. He says that the variance not only may be wasting inputs, but uneven product distribution can mean differences in seed-placed fertilizer toxicity, crop development, lodging and maturity. 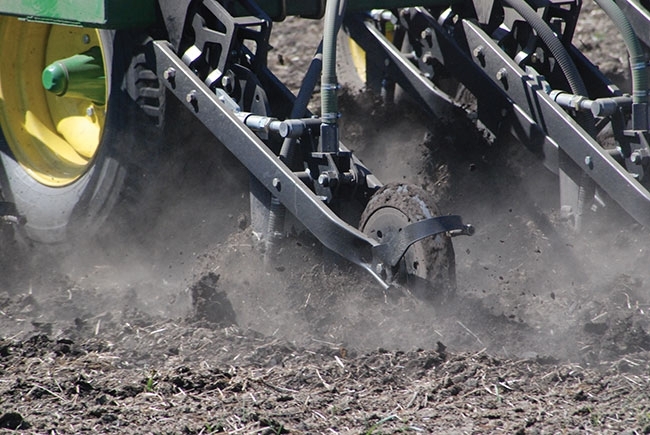 “Farmers try to get precise seed placement, but then have uneven seed and fertilizer rates that can impact stand establishment and uniformity,” Beaujot says. SeedMaster came up with a solution to cut the variance by 50 per cent by combining two technologies. The first is the XeedSystem Monitor that continuously monitors product flow in each run in real time. 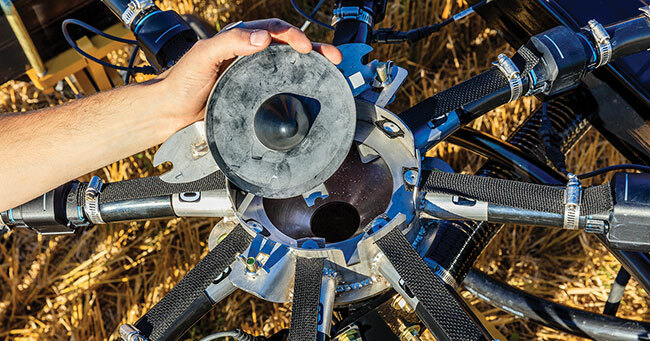 It can identify row-to-row variance to 98 per cent seed accuracy. balanced between rows. The towers can be adjusted to balance product distribution between the rows down to about 10 per cent – that’s five per cent above or below the target rate or a Coefficient of Variation of five per cent. Grieger says the PAMI results show the need for farmers to further understand the correlation between airflow, seed distribution and damage.